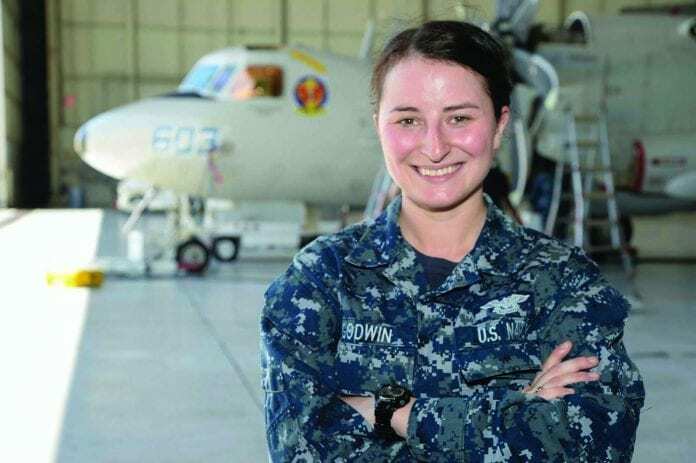 NORFOLK, Va. – A 2010 Rossview High School graduate and Clarksville, Tennessee native is serving with a U.S. Navy squadron that flies one of the Navy’s most advanced aircraft, one with an important mission: keeping watch over the skies and oceans of the world. Airman Kayla Godwin serves with Carrier Airborne Early Warning Squadron (VAW) 121, also known as the “Bluetails,” which operates out of Norfolk. Godwin works as an aviation structural mechanic, which is responsible for maintaining all aircraft main and auxiliary hydraulic power systems, actuating systems and landing gear; maintenance on the aircraft fuselage (mainframe) wings airfoils, and associated fixed and moveable surface and flight controls. “I like that we make a difference and play a big hand in the success of the mission,” Godwin said. The Hawkeye is a carrier-based aircraft, taking off from and landing on Navy aircraft carriers at sea. Using powerful radar and an array of advanced sensors, the twin-turboprop aircraft and its crew of five can remain in the air for hours, scanning the skies, detecting potential airborne and surface threats and relaying real-time information to other Navy aircraft and ships operating in the area. “I love the team here, we are like family,” Godwin said. The E-2D provides the Navy with a variety of other capabilities as well, including the ability to conduct search and rescue operations, communications relay, close air support coordination and drug interdiction. The Hawkeye can fly at nearly 350 mph at altitudes up to 30,000 feet. With over 150 sailors assigned to the squadron, jobs are highly specialized and designed to keep each part of the Hawkeye running smoothly. Whether training new aviators, maintaining airframes and engines, processing paperwork or handling and flying the aircraft, the key to success is teamwork. “I enjoy serving in the Navy and I appreciate the opportunities the Navy has given me,” Godwin said.